His Excellency Mr. Eric Laverto, Ambassador-designate of the Republic of France to the Republic of Maldives has presented credentials to President Ibrahim Mohamed Solih at a ceremony held this morning at the President’s Office. 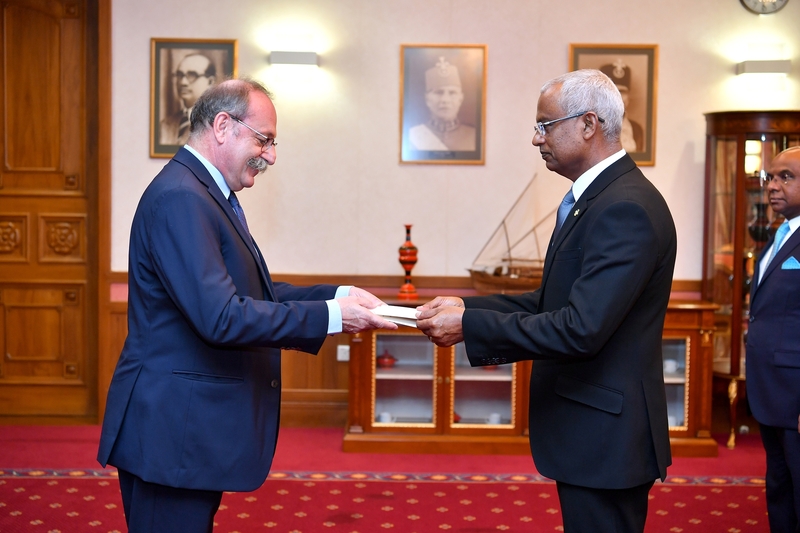 President Solih and the Ambassador briefly discussed bilateral ties, both expressing their mutual confidence that relations will continue to prosper on the basis of historically friendly co-operation; the increasing numbers of French tourists to the Maldives, and the development assistance that has been provided to the Maldives by France over the years, for which the President expressed his sincere gratitude. The Ambassador commended the Maldives on the peaceful conduct of the recently held parliamentary elections, and congratulated the President on its outcome. The President thanked the Ambassador and noted that the outcome reflects the wishes of the people, further remarking that the Government remains committed to fulfilling the pledges it has made to the people. Concluding the call, the Ambassador remarked that it was a privilege to be able to represent his country in the Maldives and reiterated his commitment to ensuring that relations strengthen during his tenure.